In 1832, William Winsor, a chemist, and Henry Newton, an artist, entered into partnership as artists' colourmen. With a business founded on the marriage of art and science, the pair set out to respond to the needs of artists and offer them the widest choice of colours with the greatest permanence. This combination of scientific rigour and a new spirit of enquiry into the craft of the artists' colourmen enabled Winsor and Newton to set new standards for colour permanence and clarity and within a few short years, Winsor & Newton had become the largest artists' materials supplier in the world. Winsor and Newton founded their business in 1832 at a time of extreme social and cultural change in Britain. The Industrial Revolution was fully fledged and was therefore generating an explosion of technology and trade from all over the world, enabling new materials to be brought into England. With their aim of providing the best choice of pigments with the highest permanence possible, Winsor and Newton were able to take full advantage of the opportunities that were opening up to them and within a couple of decades had introduced many new pigments and colour ranges. William Winsor and Henry Newton established their partnership at 38 Rathbone Place, London. This was Henry's home, which was then part of an artists' quarter in which a number of eminent painters, including Constable, had studios, and where other colourmen were already established. In 1835, Winsor and Newton developed the first moist water colours utilising the moisture-retaining properties of a recently discovered material, glycerine. The new water colour pans were much simpler and more convenient to use than water colour cakes and quickly earned well-deserved popularity. Artists such as Turner were now able to paint outdoors prolifically in water colour. The earliest negative photograph is taken by William Henry Fox Talbot. 1837 Queen Victoria ascends the throne. Royal recognition came early for Winsor and Newton in the form of appointment as artists' colourmen to Queen Victoria in 1841 and the issuing of the Royal Warrant. William Winsor patented the first screw cap mechanism for a collapsible metal tube. Following this invention, tin tubes were very quickly accepted as containers for oil colours and a few years later Winsor and Newton were able to uniquely offer moist water colours in tubes. 1844 JMW Turner exhibits "Rain, Steam & Speed - The Great Western Railway". Increased transportation combined with the availability of paints in metal tubes enabled artists to travel and paint outdoors like never before. 1848 Pre-Raphaelite Brotherhood is started by DG Rossetti, Millais & Holman-Hunt. High-quality products together with the prestige of royal appointments and awards at international exhibitions helped to stimulate trade for Winsor and Newton overseas. During the second half of the nineteenth century there was hardly any competition in the manufacture of artists' materials in non-European countries and this doubtless encouraged ever-increasing exports to the U.S.A. and also India and Australia. During 1890, William Killik, son in law to Mr. Thrupp, an original director with William and Henry, travelled to New York on the Majestic, the predecessor to the Titanic. Whilst on deck an American asked him his business and Killik replied "artists' materials". "Oh", he said "if you're going to sell artists' colours, you may as well take the next boat back because there is nothing sold in the United States but Winsor & Newton!" Winsor and Newton exhibited at The Great Exhibition of 1851 in the Crystal Palace and were awarded the only prize medal open to competitors for artists' colours. This was the first of many successful exhibits in numerous International Exhibitions, including the Chicago World Exhibition in 1893, where Winsor and Newton were awarded the medallion for the development of permanent artists' colours. Charles Darwin publishes "The Origin of the Species" establishing evolution by common decent. 1874 Claude Monet exhibits "Impression: Sunrise" at the first exhibition of the French Impressionists. This exhibition marks the birth of Impressionism. A few months before the death of Henry Newton in 1882, Newton sold the business to the newly incorporated firm of Winsor & Newton Ltd which included members of both families amongst the shareholders, with Newtons employed until the late 1970's. Vincent Van Gogh paints four "Sunflower" paintings between August - September in Arles, France. Wholly dedicated to ensuring artists used the most stable and permanent pigments, Winsor & Newton were the first artists' colourmen to publish the composition and permanence of their colours. Until the beginning of the twentieth century Winsor & Newton had concentrated entirely on products for painting and drawing. However, by the Edwardian period the painting market was very different due to the invention of the camera and artists were no longer in such great demand. The company began to take up craft products, starting with pen painting materials in 1911, and the range was expanded over the following years. It was fortunate that home trade was broadened in such a way, for overseas trade suffered a series of setbacks during the first world war years and subsequent depression. However, during the second world war manufacture of artists' and draughtsmen's materials continued for the war effort despite limitations imposed by raw materials shortages. 1907 Picasso paints "Les Demoiselles d'Avignon" which is exhibited at the first Cubist exhibition in Paris in the same year. This cataclysmic event ends the main era of the British Empire forever. By the 1930's the conditions of economic depression had had a very serious effect on the volume of trade both at home and overseas, and directors of the firm decided to compensate for this by making and selling colours of students' quality. Innovation continued throughout the decade, however, and in 1937, Designers Gouache was introduced, a highly pigmented opaque water colour. It became the most popular medium used by graphic designers and also allowed fine artists to use body colour in water colour without having to add white to ordinary water colour. To increase efficiency and reduce costs, all Winsor & Newton activities were moved to Wealdstone, Harrow. Colour manufacture was transferred there from the North London Colour Works in 1938 and the administrative offices were moved from Rathbone Place the following year. This was good fortune indeed as it meant our archives and business were safe when Rathbone Place was destroyed in the London blitz just a year later. The Cold War followed the enormity of this war which continued to dominate world relationships for subsequent decades. In the immediate post-war years after the activity of war, brush-makers tended not to return to a sedentary occupation. For this reason it was necessary to look for a new factory site in an area with a surplus of labour. The East Anglian fishing port of Lowestoft proved perfect, as the skills required for mending the fishing nets could be transferred to tying knots for brushes. A brush making department also continued at Harrow until 1982. 1963 The first large scale exhibition of Pop Art takes place in the New York Guggenheim museum, bringing Pop Art to a broader international audience. Neil Armstrong becomes the first man on the moon. In 1970, Winsor & Newton introduced their first range of Artists' Acrylics, a revolutionary water based paint, which has subsequently become as popular as oil colour. In 1976 the first alkyd colour for artists was introduced by the company. This fast drying oil colour range enabled outdoor artists and designers to complete oil paintings in a fraction of the time required with conventional oils. 1990 The World Wide Web/Internet protocol is created by Tim Berners-Lee. In 1996, Winsor & Newton embarked on the most significant change to the Artists' Water Colour range in 164 years. The availability of so many new pigments meant that 35 new colours were introduced into the range, offering artists the widest and most balanced spectrum with the greatest permanence. 1999 The importance and influence of the Young British Artists movement was verified at the "Sensation" show which attracted mass media and public attention in London and New York. Winsor & Newton revealed the results of a long research project to supply a range of both colours and mediums in oil which could be thinned and cleaned up with water. 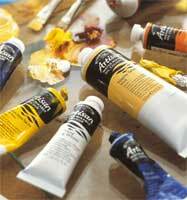 This range has allowed an enormous number of artists to enjoy oil colour without the use of hazardous solvents. Winsor & Newton launched a worldwide painting competition, "Our World in the Year 2000", to celebrate the Millennium year. The largest art event of its kind ever held, the competition attracted entries from over 22,000 artists in 51 different countries, with judging chaired by H.R.H The Prince of Wales. In 2007 Winsor & Newton celebrate 175 years of colour making. To commemorate this milestone event, we have re-formulated Smalt, a beautiful blue pigment that was used in ancient times but subsequently became obsolete. Today, in our 175th year, we are proud to have been able to re-formulate this colour to match our best quality sample from the nineteenth century, offering artists a beautiful, deep blue water colour that has a large particle structure, resulting in washes that really sparkle and suggest beautiful texture!